Sculpey Bake & Bend is a non-toxic modeling compound that will not dry out when exposed to air. It stays soft and pliable until baked in a regular oven at 285°F (140°C) for 20 minutes per ¼" (6 mm) of thickness. 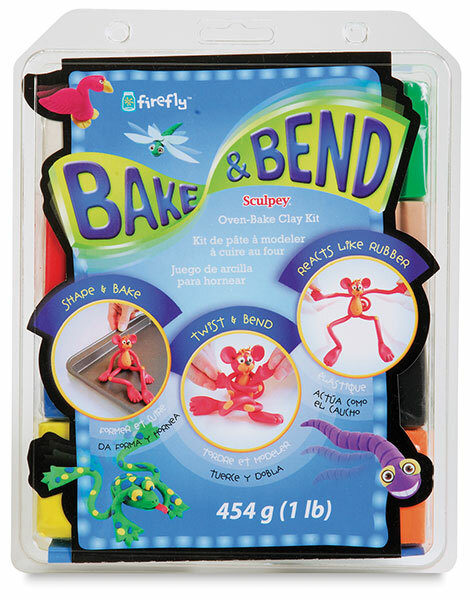 Once cool, Bake & Bend remains bendable and flexible, practically indestructible, so it's great for kids because they can make, bake, and play with their creations! Set includes basic instructions as well as step by step instructions to make a project. Set of 8 Colors — The set includes one 2 oz (57 g) bar in each of eight colors: Beige, Black, Red, Green, White, Yellow, Blue, and Orange. A clay roller is also included. ® Sculpey is a registered trademark.™ Bake & Bend is a trademark. With so many Sculpey clays available it is hard to know which to choose. This video explains the difference among all the Sculpey "specialty" polymer clays, such as Sculpey Bake & Bend, Sculpey Bake Shop, Studio by Sculpey, Translucent Liquid Sculpey, Sculpey Moldmaker and Sculpey UltraLight. Learn about the unique attributes of each — so you know exactly which product to select for your next polymer clay project.